Pasta makes me happy. It’s what I crave when I’m having an off day or am feeling homesick for my family. Or just in the mood for something good. I shared this big bowl of comfort over at Family Kitchen last week. 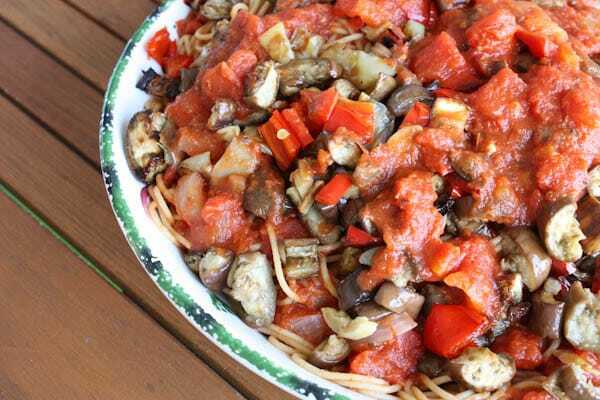 Here’s the recipe for Pasta with Roasted Vegetables and Tomato Sauce. Hope you are having a great weekend…. Pasta is my favorite comfort food too. Great recipe, and perfect for the colder weather! Mmmm… for me it’s pasta with something cheesy and melty! And veggies, absolutely! I couldn’t agree more. Pasta is the total comfort food. And how delicious does this look with all those beautiful roasted vegetables! Your Pasta looks so tasty! A big bowl of pasta always makes me happy too! Looks fantastic. I couldn’t agree more! It looks delish! Comfort IS a big bowl of pasta! I could eat this for breakfast. 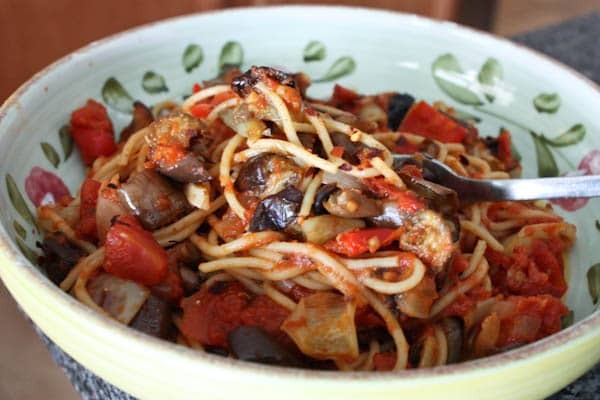 I am always up for a big bowl of pasta with veggies! Yum! Pasta makes me happy too. But it also makes me fat, since I eat too much of it and I prefer cream sauces. Oy!